Brilliant Red with Yellow Roses are flanked by Clearand Blue glass jewels and Violet/Mauve flowers whichare surrounded by Green and Jade leaves. Honey coloredloops linked by Blue jewels on Blue/Green Rippledglass feature Bone Beige with Amber bell shapedflowers that are crowned with stylized fleurs in AmberRed and Blue/Purple. The background features HoneyBeige with streaks of Blue Ripple glass. The gracefulbase is finished in a warm Mahogany Bronze and supportsthe unique art glass shade which is created with MeydaTiffany’s famous copperfoil construction process. Meyda offers an extensive line featuring thousands of styles-- from accent pieces to masterpieces. Many of Meydas lighting designs were inspired by the works of Louis Comfort Tiffany Dirk Van Erp Gustav Stickley Philip Julius Handel Pairpoint and Duffner & Kimberly Studios Charles Rennie Mackintosh. Some have been handcrafted of copperfoil and reverse-painted art glass porcelain jadestone mica and other fine mediums. Others were influenced by popular art movements: Arts and Crafts Prairie Lodge Mission Bungalow Victorian Nouveau Gothic Southwest and Deco. The firms extensive line includes table and floor lamps ceiling pendants flush and semi-flush mounted ceiling fixtures chandeliers wall sconces windows fireplace screens furniture and more. With one of the industrys most extensive new product development programs Meyda creates scores of new designs weekly. Lamps or stained glass lighting are the Perfect Home accent. Choose fashion forward Comfort Lighting. Your custom lighting choices are unlimited. You name it - Meyda Tiffany has it all. See our American-made Lighting and glass shades. Satisfaction ensured. For the perfectlamp or stained glass lighting to accent your home or space Meyda Tiffany handcrafts beautiful decorative lighting for any room or application. Meyda Lighting creates custom mica chandeliers stained glass table lamps Craftsman outdoor lanterns and landscape lighting. One Of The Most Popular Louis Comfort Tiffany Styled Lamps On The Market Today Recreating His Famous Favrile Design From The Early 1900 S. This Softly Mottled Cranberry Red Shaded One Light Accent Lamp Offers An Attractive Delicate Design Featuring A Shade Of Mouth Blown Of Fine Art Glass. Lily Shades Are Seated In An Elegant Base Finished By Hand In Mahogany Bronze. TOTAL:8&quot;H. SHADE: 3.5Hx4W BULB: CNDL MAX WATT: 25WTPlease allow 14 days lead time for order. Meyda offers an extensive line featuring thousands of styles-- from accent pieces to masterpieces. Many of Meydas lighting designs were inspired by the works of Louis Comfort Tiffany Dirk Van Erp Gustav Stickley Philip Julius Handel Pairpoint and Duffner & Kimberly Studios Charles Rennie Mackintosh. Some have been handcrafted of copperfoil and reverse-painted art glass porcelain jadestone mica and other fine mediums. Others were influenced by popular art movements: Arts and Crafts Prairie Lodge Mission Bungalow Victorian Nouveau Gothic Southwest and Deco. The firms extensive line includes table and floor lamps ceiling pendants flush and semi-flush mounted ceiling fixtures chandeliers wall sconces windows fireplace screens furniture and more. With one of the industrys most extensive new product development programs Meyda creates scores of new designs weekly. Lamps or stained glass lighting are the Perfect Home accent. Choose fashion forward Comfort Lighting. Your custom lighting choices are unlimited. You name it - Meyda Tiffany has it all. See our American-made Lighting and glass shades. Satisfaction ensured. For the perfectlamp or stained glass lighting to accent your home or space Meyda Tiffany handcrafts beautiful decorative lighting for any room or application. Meyda Lighting creates custom mica chandeliers stained glass table lamps Craftsman outdoor lanterns and landscape lighting. 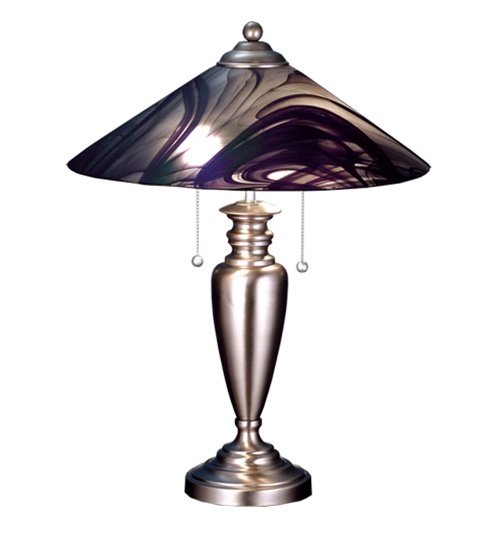 One Of The Most Popular Louis Comfort Tiffany Styled Lamps On The Market Today Recreating His Famous Favrile Design From The Early 1900 S. This Mottled Amethyst Tipped Amber Shaded One Light Accent Lamp Offers An Attractive Delicate Design Featuring A Shade Of Mouth Blown Of Fine Art Glass. Lily Shades Are Seated In An Elegant Base Finished By Hand In Mahogany Bronze. TOTAL:8&quot;H. SHADE: 3.5Hx4W BULB: CNDL MAX WATT: 25WTPlease allow 14 days lead time for order. Unless otherwise noted within product description item ships in 5-9 business days. This lamp shade inspired by the clean geometric lines of the mission style has diamonds and bands of rootbeer granite glass on panels of bone beige and moss green. Hand cut pieces of glass are wrapped in copperfoil and soldered together in the tiffany tradition to make this handsome shade. The hexagonal shaped shade is matched with a similarly shaped base hand finished in mahogany bronze. 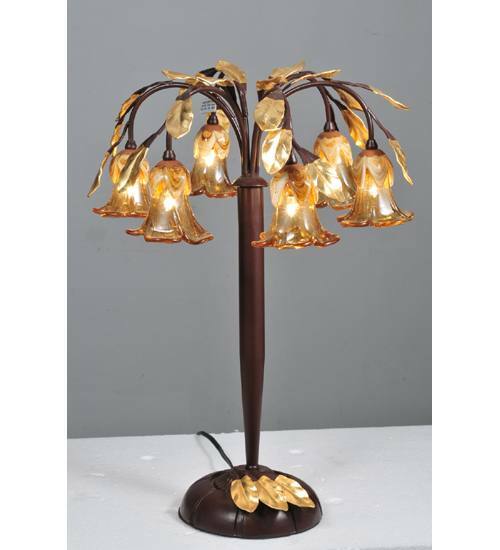 Three light Urn table lamp base with pull chain cluster. Shade: 8 H x 14 Square. Bulb Type: A19 x 2 Medium. Shade: 7 H x 14 Square. Shade: 9 H x 20 W.
Bulb Type: 19 x 3 Medium. Shade: 9 H x 18 W.
Meyda offers an extensive line featuring thousands of styles-- from accent pieces to masterpieces. Many of Meyda's lighting designs were inspired by the works of Louis Comfort Tiffany, Dirk Van Erp, Gustav Stickley, Philip Julius Handel, Pairpoint and Duffner & Kimberly Studios, Charles Rennie Mackintosh. Some have been handcrafted of copperfoil and reverse-painted art glass, porcelain, jadestone, mica and other fine mediums. Others were influenced by popular art movements: Arts and Crafts, Prairie, Lodge, Mission, Bungalow, Victorian, Nouveau, Gothic, Southwest and Deco. The firm's extensive line includes table and floor lamps, ceiling pendants, flush and semi-flush mounted ceiling fixtures, chandeliers, wall sconces, windows, fireplace screens, furniture, and more. With one of the industry's most extensive new product development programs, Meyda creates scores of new designs weekly. Named for the greek word for light the ilona table lamp will stir conversations among family and friends with a dramatic interlocking motif in yellow and white on a green background of art glass. Root beer colored scalloped glass borders and beige colored panels enhance the beauty of this tabletop piece;complemented with a lavish mahogany bronze finished base. Shade: 8 H x 18 W.
Shade: 7 H x 16 W.
Simple clean lines and a geometric shape are thehallmark of this Mission styled table lamp. The shadeis Beige with Honey trim with Green glass surroundingthe Amber cast glass jewel and an Orange diamond. Thelamp base is hand finished in a warm Mahogany Bronzeand supports a shade that is handcrafted using the sametechnique as the Louis Comfort Tiffany Studio. 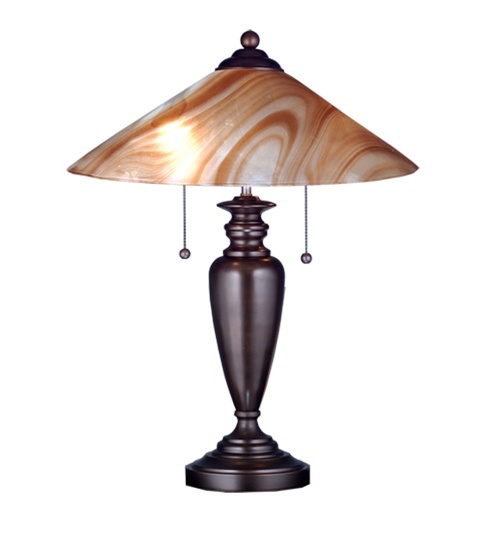 The classic American lamp design to complement yourhome. The art glass shade features a single BungalowRed Poppy with Moss Green leaves on a Sunkissed Beigebackground with striking geometrics on the skirt. Theart glass shade is complemented with a decorativeMission styled base accentuated with a Mahogany Bronzefinish. Lovely tropical Flowering Bamboo in Leafy Green adornthis Bone Beige art glass shade which is trimmed witha Bark Brown ringlet motif with perfectly pairedEmerald colored glass jewels on the skirt. The uniquecomplementary Bamboo styled base is accented with Greenleaves and a Parrot while the shade is created withMeyda Tiffany's famous copperfoil construction process. The Dragonfly re-creates Tiffany Studio's most beloveddesigns in all of its splendor. A stunning Dragonflyflies and dives with glowing Golden Yellow glass eyesa Sky Blue tail and delicate Blue Yellow and Greenglass wings over hand-cut and copperfoiled pieces of aBlue/Green scroll-like border. The Beige Iridescentglass background is separated by White swirled piecesand accented with Golden glass jewels. The shade iscomplemented with a Mahogany Bronze finished base.